Combining both the elegant design of the U5 and the power of the raMa, the new LUXEED U7 Crossover lets users switch between Plug & Play method or Software Control method for versatility. Use plug & play for easy color effects, or switch to software control for more advanced animation styles like MuSkins™. (MuSkins™ software is a add-on software sold separately.) Do more than color: interact with the world around you! Whlie keeping the same breathtaking effects and features of its predecessors, the U7 now allows you to save an unlimited number of ColorSkins™. Share your creations with other LUXEED users across the world. With the new MuSkins™ feature, LUXEED U7 can also sense and interact with your music. Adjustable brightness controls, integrated multimedia keys, and four easy-recall buttons still make the LUXEED a dynamic, fully customizable all-in-one solution. You may download the manual in advance by clicking here. Any defective keyboards, even cuased by customer's misuse, within 5 years from the point of purchasing, will be repaired free of charge or replaced if necessary, with the condition of postage prepaid by each sender. 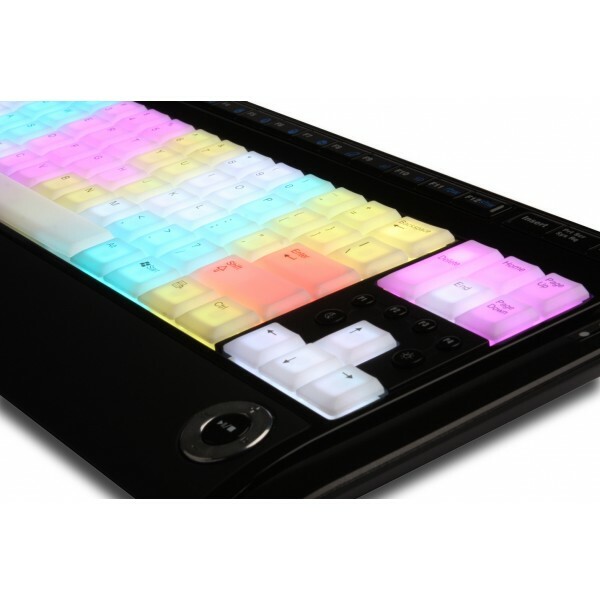 All black case with semi-transparent white keys, Individual key color coding, Switchable between Plug & Play method and Software Controlled method, MuSkins™ feature, One silicon KeySkin enclosed [Note] Either U7 program or MuSkins™ software is sold separately.